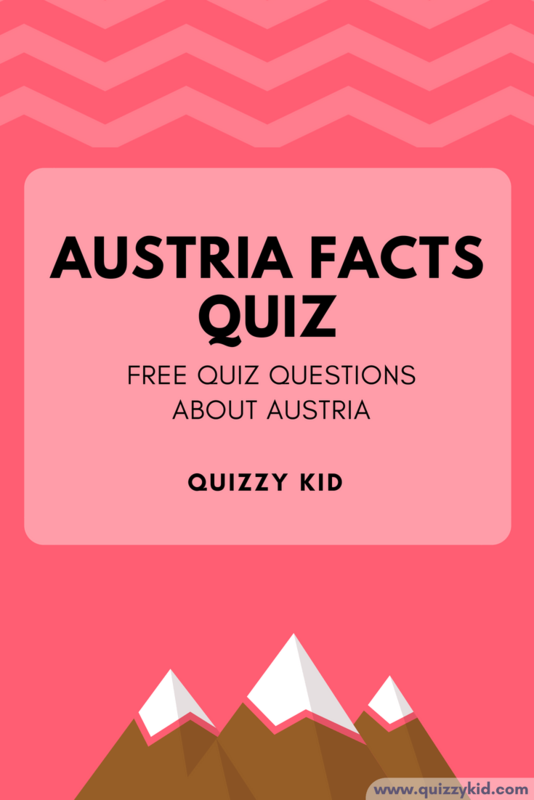 These 10 free quiz questions will teach you all sorts of Austria fun facts. Just how much do you know about this beautiful country? If you're planning a trip to Austria and are looking for inspiration then check out this Austria travel blog for all sorts of tips and advice about visiting the country. Have a go at the quiz questions and see how many you get right. Want more of a challenge? Download our 20 question quiz pack which includes questions, answers and worksheets! Good Luck! For more geographical quizzes check out our Geography Page. We have quizzes on Botswana, Italy, France and lots more! Q1. What is the currency in Austria? Q2. What is the capital city of Austria? Q3. What 2 colors are on the Austrian flag? Q4. What's the name of the highest mountain in Austria? Q5. What is the main language spoken in Austria? Q6. What continent is Austria in? Q7. How many countries is Austria bordered with: 5, 6 or 8? Q8. What popular dessert often filled with apple comes from Austria? Q9. What is the national symbol for Austria? Q10. What is the name of the famous river that runs through Austria?